Here's a great article from the good folks over at AutoWeek. This car sure beats the heck out of your basic Crown Victoria police cruiser! The winner of the award for the world's fastest police force goes to the Lazio Highway Police Department in Italy. 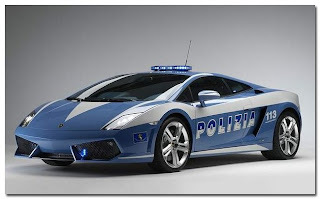 A private ceremony was held recently at the Viminale Palace, where the boys from Sant'Agata were on hand to donate a brand-new Lamborghini Gallardo LP560-4 to the police force. The new Lamborghini will take the place of the force's first-generation Gallardo, which it received in 2004. The car served brilliantly, logging 87,000 miles and not needing any repairs aside from scheduled maintenance. direction can be marked, along with the speed and time to intercept potential wrongdoers. 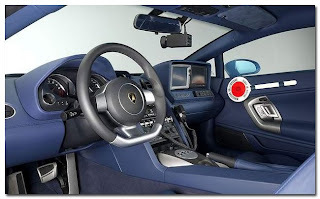 The Gallardo also is equipped with the standard police gear--a radio, computer, gun holster and the handheld stop signs they use when pulling people over. All 30 of the police officers who drive the Lamborghini have been specially trained in the use of car for high-speed maneuvers, medical emergencies and pursuit. The LP560-4 is so fast, in fact, that Lamborghini had to rework the flashing blue beacon on top to make it more aerodynamic, considering the top speed is somewhere near 200 mph. We think that's pretty cool--for Italy. We just don't want to see any police-service Dodge Vipers or Corvette ZR1s in our rearview mirror.